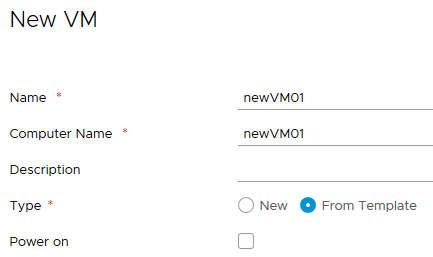 If you opted to bring your own firewall, virtual or physical, when deploying VMs follow the steps below to provide network access for the new VM. Navigate to the VM details > Hardware > NICs. Connect the NIC and select the network you want to attach the VM to. Select None for the IP Mode. You can then manually set network configuration in the guest OS assigning IP, netmask, gateway and DNS appropriate for the network selection.